Happy Happy Tuesday!! Time for another challenge at SHOPPING OUR STASH. This week's theme is Cabin Fever. Visit the blog for all the details on this challenge and to show my teammies some crafty love. I chose to go with the "something outdoorsy" part of the challenge and make a Team Canada themed hockey card for my cousin for his birthday. I wanted the jersey to look well worn, beat up, bloody....kinda like the jersey he would wear for pond hockey (yeah it's short sleeved, we Canadians are a tough bunch!!!). I did a LOT of distressing on the card, layers and the jersey. The white layers I spritzed with red marker to look like blood. I am notorious *GASP* for cutting up my stamps so I can use them in other ways, especially sentiment stamps. This stamp originally said "What's Up Canuck?" I didn't like the border on the stamp, I wanted it all in a wonky line and I didn't want the 's on the end of what...so I butchered it to get what I wanted and I like it MUCH better!! 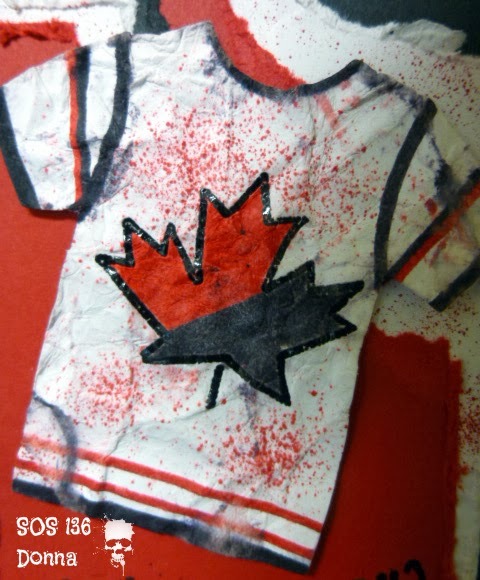 I heat embossed the maple leaf on the jersey and the sentiment. 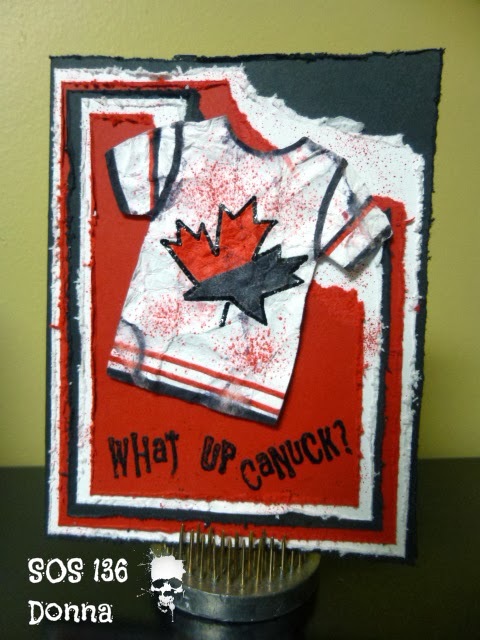 Studio G stamps (Michaels) - Maple Leaf & What's Up Canuck? Great Card Donna, bringing the frozen pond hockey fans in. Very outdoors-y and very "Canadian" love your t-shirt die too, you do fabulous things with it. A bloody jersey! Awesome! Lol! A most excellent guy card, Donna! Messy, bloody, wrinkled...honestly, this couldn't be any more awesome, possum! Bwahahaha! Blood and gore at SOS! I went to HS with a guy who said if there isn't blood at a hockey game, it wasn't really a hockey game. Also, YAY for cutting up your stamps. I love doing that - so many more options! OMG! I love this card. Go Canucks! I also have that stamp. I am off to cut it up! Thanks so much for the inspiration. OK this is such a fun fun card! I love that the sentiment is all "wonky" and I love the distressing. Perfect idea to emboss the leaf on the jersey, just like it would be on a real jersey! Great card!